As many by now know, there is no shortage of politicians who wanted to receive campaign donations via their supporters’ mobile phones. This week, they’re a step closer as the Federal Election Commission cleared certain hurdles for those politicians by offering protection for wireless carriers over fraud related issues. These proposals have engendered widespread, bipartisan support from political campaigns and reform groups alike because they offer a new and dynamic vehicle for political engagement. I feel strongly that making the political process more accessible to more people will help ensure full participation in our democracy, and today’s opinions represent an important step in that direction. The current presidential candidates – President Obama and Governor Romney – both supported this technology that would allow donations via smartphone. Both camps agreed this approval would mean empowering smaller donations, especially considering the majority of both candidates’ donations are from big business. Wireless carriers were taken out of the mix when it comes to any type of blame in potential fraudulent campaign donations. They were also given the right to refuse text-donation services to campaigns if they are not deemed commercially viable. The FEC on Wednesday put the sole responsibility onto the political campaigns and reiterated they each must ensure the donations are legal and are in compliance with all applicable laws. The FEC also ruled that carriers, like other vendors in the past, should be allowed to develop commercial eligibility criteria that would allow them to refuse text message donation services to some campaigns. For instance, the mobile carriers could opt to only accommodate presidential campaigns or it could be they may not allow the option to vote for any candidates who aren’t on the ballot. Further, despite the ruling that opens the doors for these types of donations, a carrier can still decline to participate, especially if it’s not in their commercial interest to participate. 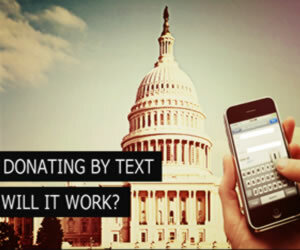 One financial lawyer said text donations could potentially be the method of delivery for politicians and their supporters. said Jan Baran, a prominent campaign finance lawyer. The FEC seal of approval also means anonymous donations by text are allowed, though they’re limited to $10 per text, $50 per month and $200 per cycle. Despite the ruling, there are still several mobile companies, including the nation’s four biggest, Sprint Nextel Corp, Verizon Wireless, AT&T Inc. and T-Mobile USA, that are asking the FEC for another vote for more specific guidance. These four carriers account for about 90 percent of the 330 million-plus wireless subscriptions in the nation. The potential is great, to say the least. Then there are the many surveys of voting-age consumers that would support the option or app on their phone. It’s no coincidence that young voters would most likely take the more technological route – and the cleared hurdle means voters can donate via this method, even as election day is less than three months away. Millions have already received text messages from the Obama camp with requests to “tell Congres” this, that and the other. Now, though, those recipients can text back with their donations. Now, if only they could find a way to allow us to cast our votes via our smartphones. During the Ford Administration, in 1975, Congress created the Federal Election Commission (FEC) to administer and enforce the Federal Election Campaign Act (FECA) – the statute that governs the financing of federal elections. Nixon had just been impeached and VP Ford had only been sworn in a few months months earlier. The Watergate scandal was still forefront and the economy was depressed, energy sources were short and inflation was rising fast. Americans had long since declared the government as incompetent and irresponsible. The FEC was designed with the goal of providing transparency in all things related to campaign donations and candidates. In many ways, the process of how it was founded is similar to the reasons behind the Consumer Financial Protection Bureau being formed: consumer and taxpayer dissatisfaction, government scandals and a lack of transparency in the industry.